My 8 year old LG TV is on the fritz again. About 3 years ago, the HDMI inputs weren't working so I had to take the mainboard out and put it in the oven for 25 min to get it working again. Well 3 years later, it's doing the same thing. This time though, I just held a hair dryer to the HDMI chip for 25 min and it's working but who knows for how long. I guess this is a better time than any for a TV to break down but now I have a choice to make. 2) Ger a 65" Vizio P-Series LED/HDR TV for around $1,300. I guess a bigger screen or better picture quality is a personal choice for most people and one that I need to figure out soon! Since neither is your dream TV, I'd go for spending less and getting a bigger screen. I'm also beginning to think that the dirty little secret about picture quality is that all modern TVs look amazing compared to TVs from ten years ago, and most people can't tell the difference between average PQ and elite PQ. If in the US, Costco will be offering the Vizio 65" PQ series for $1400 starting November 16. It's a pretty significant step above the p series. I did see that! That's the TV I was actually referring to. I want to get it at Costco so it's easy to return if there is a problem and the one near me is 5 minutes away. I was thinking just this. The main thing I want is HDR and I'm sure that's going to automatically make a bigger difference along with going from 47" to 65". Also, e what T-Prime said, there will be added costs to the entertainment system in the future. So now I am favoring the Vizo P-Quantum set. Thanks for talking some sense. I get so caught up in reviews that it becomes paralyzing at times. Oh, rtings is the place! It's been to go-to review site recommendation of this thread for a while. Rtings is one of the very few out there that does comprehensive, consistent, repeatable testing of everything they cover. Where is the Quantum model $1400? I've never seen it below $2000. For projectors, input lag is no longer a definite problem, bulb life has increased significantly on average over the years, and cost to operate has of course dropped alongside. Multiple popular projectors are down in the 15-16ms range for input lag that is generally just as good as the very best TV's according to that one particular criteria. Cost to operate per hour on my Epson is 4.2 cents an hour (I bought bare OEM bulbs, not a whole new lamp, it's significantly cheaper), and the bulb life on it is lower than average with a higher than average lamp cost. I've seen some bulbs rated at 8,000-10,000 hours and lamp replacement costs as low as $60. Just figure out your priorities, do your research on what options you have and what works for you and your space and you'll be fine. Projectors aren't for everybody but IMO they could work execellently for a fair number of folks who just assume otherwise. And as Rykin mentioned, laser projectors are getting down into the ~2000$ range, and the lifespan on those is usually above 20,000 hours. Lowest I've seen is I think 18,000 hours, highest around 27,000. That said, I have no idea what cost to replace is on the light source in those is. That would of course effect the cost to operate math. Point being 10 cents an hour is not normal anymore and input lag is no longer an issue if you research your projector the same way you would a TV. $1400 only at Costco starting 11/16. Part of their pre Black Friday sale I guess. About the middle of this page. On the ones we have there isn't even access to the bulbs nor are they available to buy from what I have seen. I'm on the other side - I wish the PQ were made in 55" for my small living room! 65" would just dominate the space too much. You probably can get the Vizio now and get the price adjusted by Costco on the 16th which I've done before on smaller items. I don't really want to take that chance with this much money though. I want to be dominated. Yeah, my experience is pretty old (wow, I think probably 13 or 14 years ago, now), and it sounds like the cost has come down a fair bit. Even ten cents isn't that bad, really, unless you're watching it 10-12 hours a day. But it sounds like that's not a common figure anymore. And it's good to hear that the lag can be okay ... it was really bad on mine, and I'm not that lag-sensitive. I gotta tell ya, a TV screen that's best measured in feet is something that's very easy to get used to. edit: oh, light control is the other big thing with a projector. I assume the brightness has improved over the last decade, but I doubt very much that a tiny bulb blasting from fifteen feet away onto a ten-foot screen is going to be anywhere near as bright as, say, an OLED, or a window. You need a room you can darken pretty well to use one consistently. And this remains true: never strike a projector bulb when it's hot. Once it's off, it stays off for awhile. My rule of thumb was an hour, although that might be excessive. Both still true in general, although there are some *very* bright models (~4500 lumen) that combined with an even middling quality ambient light rejecting screen material can look amazingly good in a well lit room. It's far too much money for me to justify, at least right now, but man does it do amazing stuff for projectors in brighter rooms. Holy crap that is glorious. I wonder if I can talk them into switching out the planned screens in our new building for those? Not likely as they are already feeling the pinch over the half a million dollars the AV is going to run. I woke up at 12am and then 3am EST this morning to order the Vizio 65" P-Quantum TV from Costco for $1400. Good thing I did because it was sold out by 6AM EST. It's a shame that it's online only and it's a hard TV to find for some reason. I ordered the LG 55" C8 OLED this morning, finally upgrading our creaky 2010 Samsung LCD. BJs wholesale had it $50 cheaper than Amazon, who had already cut the price pretty well. Looking forward to having a nice new TV. Home Theater Review just put up this this review of the Vizio PQ-F1 just as mine shipped from Costco. 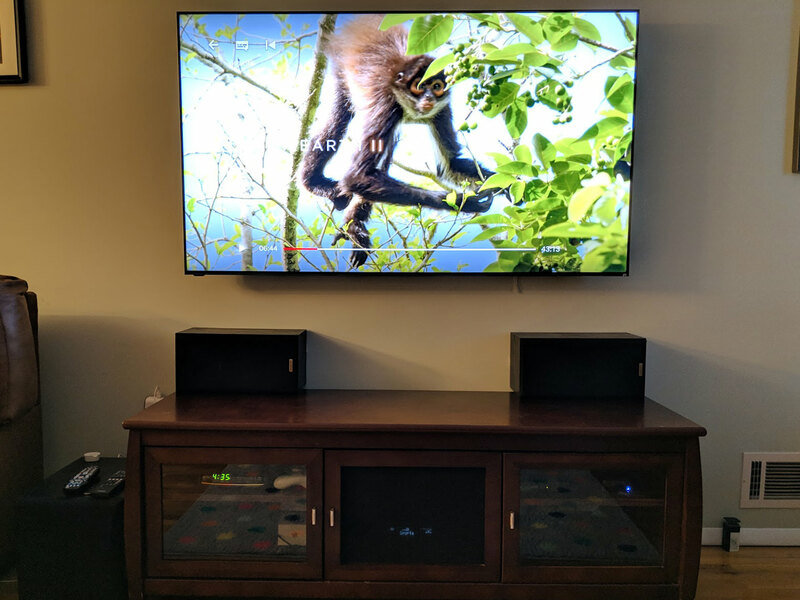 I finally got the Vizio PQ-65 yesterday, a month after I ordered it from Costco but it was worth the wait. This is TV bonkers. The black level is definitely on par with an OLED. I saved watching Daredevil until we got the TV and the contrast of the black and the really bright lights are gorgeous. The only headache I ran into is my AV receiver. I have a 4 year old Yamaha v375 and the site said that it supports 4K but it apparently only supports an old 4K standard up to a certain hz AND it does not support any version of HDR. My TV is wall mounted with the wires behind the wall so this is now a hassle since I need to run all the wires from my Roku Ultra, Gaming consols and other 4k things behind the wall as well and not just the 1 HDMI cable. It's either that or shell out more money for a new AV receiver. It's impossible to take a good picture of a bright TV even with the Pixel 3! Shame.. I think I would actually be happy with that TV if they made a bigger version.. 85" for a reasonable price would be ideal for my basement. I assume there is two holes in the wall. One behind the TV and one behind the stand. Drop the wires through the wall to the lower hole. Couldn't you just get an HDMI switch so you only have to use the one cable? Pretty much what Jay said. the hole behind the TV is about where that monkeys head is in the center of the mount. I have an old ethernet cable that I leave inside the wall so when I need to fish new wires through, I attach the new wire to the ethernet cord with electrical tape and yank it up. This does make a lot of sense and not sure why I didn't think about it... I suppose there are 4k/HDR/HDCP 2.2 switches out there now? I currently down own any 4k HDR game consols so the Roku Ultra will be the only dedicated 4k device. I'll get a switch once I inevitably expand. Ignoring the 8K “hype” LG is implementing HDMI 2.1 with Variable refresh rate and I believe 120hz at 4K. This is excellent news despite only AMD and the Xbox One X supporting VRR. I would love a VRR 4K OLED TV of 75" or more, but prices are probably going to be silly for a while. The 2018 77" LG OLED was $4900 on Massdrop at Black Friday... still expensive but half the price it normally is.. I look to that again towards the end of 2019 which is when I will jump on the 77".